SAN ANTONIO, TX- The International Brangus Breeders Association (IBBA) launched the Brangus Built commercial program designed to help producers identify and garner the added value associated with the Brangus influence of their commercial replacements. Brangus Built cattle are commercial cattle that are identified as having high valued Brangus influence. 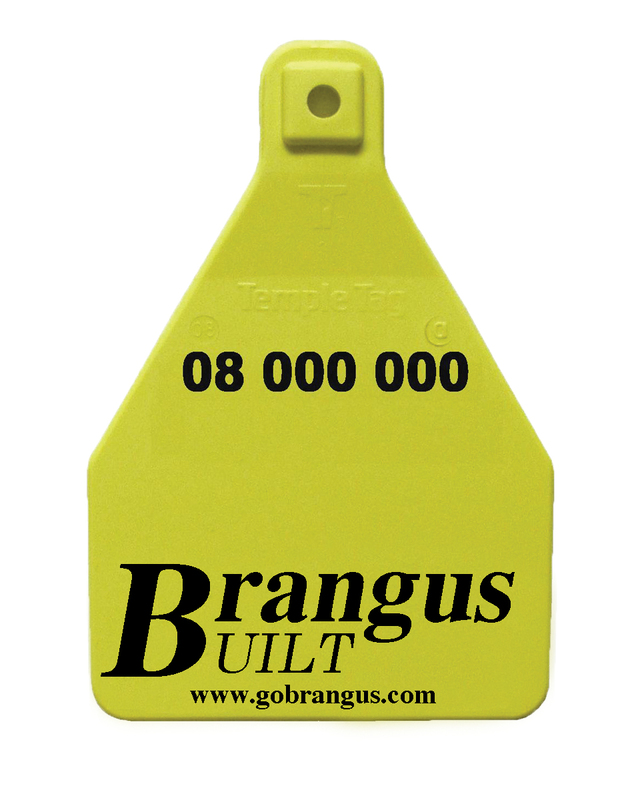 The eligible cattle will be assigned ear tags that have the Brangus Built logo along with an individual ID number as well as plenty of room for the producer to add any identification that fits into their program (example: herd ID, dam and/or sire ID, lot number). These tags can stay with that animal indefinitely. For more than 65 years, the Brangus breed has been known to excel in maternal traits. Brangus cattle have the built-in heterosis from the combination of Angus and Brahman genetics the allows them to transcend other breeds in terms of longevity, fertility, udder soundness, early breed back, and other important maternal traits while still maintaining outstanding performance and carcass characteristics. The current lows in the nation’s cow inventory and price of feeder cattle has caused a surge in the price of replacement females because so many producers are sending the heifers to the feedlots. The Brangus Built program will help producers maximize their return because a buyer will be willing to spend more knowing those cattle have been identified as having Brangus influence. In the future, as commercial replacement female prices level off, it will be vital for producers to have an avenue that identifies the added value of their product. The Brangus Built program was designed with that in mind. Contact Jason Bates at (210) 696-8231 to find out about using Brangus genetics and how you can get enrolled for your FREE tags for a limited time, or visit us at www.gobrangus.com for more information. 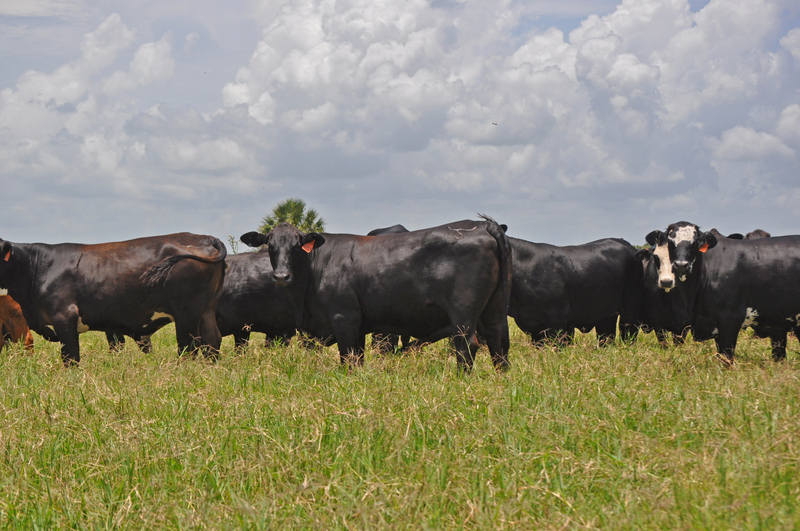 COLLEGE STATION – When it comes to replacement heifers in beef cattle operations, producers are faced with a dilemma: Raise them, buy them or sell them and “take the money and run,” said a Texas A&M AgriLife Extension Service economist. Bevers said since this ranch was located in Oklahoma, one would need to add $300-$400 a head to that for Texas ranchers and regional market prices to develop replacement heifers. SAN ANTONIO, TEXAS–The Southeast Brangus Breeders Association (SBBA) hosted its annual field day at the Draggin’ M Ranch in El Dorado, Ark., August 22-23, 2014. With more than 225 producers in attendance, the event was fun and informative for all who participated and demonstrated a growing interest in expansion opportunities. The event kicked off Friday, August 22, with a social and steak dinner in which Evon Crooks, President of the SBBA, and John Milam, host and owner of Draggin’ M Ranch, addressed the crowd. A dance and private concert from the Ray Johnston Band provided fun entertainment for guests that evening. Saturday’s schedule began with a preview of a few well-known herd sires, including Guardian, Landau, Onstar and Coronado just to name a few, and their progeny from several different breeding programs. Following the display of these great genetics, Dr. Noah T. Cosby, representing Purina, talked to field day participants about the importance of a nutrition plan and products available to improve herd condition and health. Dr. Andrew McPeake of VitaFerm spoke about the added value that can be gained from balanced nutrition programs. Lorna Marshall and Justin Hergenreder, representatives of Genex, gave a presentation about the benefits and trends of artificial insemination and the value of data reporting. Dr. Tommy Perkins, Executive Vice President of the International Brangus Breeders Association (IBBA), addressed the group regarding the positive outlook for the Brangus breed as the industry begins to rebuild the cow herd and answered questions about DNA testing procedures. “The Field Day was very organized, extremely educational and well attended,” said Perkins. “Having several mature herd sires and their progeny on display was just ‘icing on the cake’ for an already outstanding event”. Later that afternoon participants directed questions and topics to a panel of producers representing both the commercial and seedstock sectors. Jason Bates, IBBA’s Director of Field Services and Commercial Marketing, moderated the panel consisting of Lorna Marshall of Burlington, Colo.; Mike Vorel of Luther, Okla.; Zak O’Brien of South Coffeeville, Okla.; Chad Parish of Mt. Pleasant, Texas; and Chris Heptinstall of Fairmount, Ga.
Video highlights and coverage will be available at GoBrangus.com. Sponsors of the SBBA field day were the city of El Dorado, Stockman’s Supply, VitaFerm, Purina and First Financial Bank. The IBBA, headquartered in San Antonio, Texas, strives to provide the commercial cattle industry, domestically and internationally, with the best genetics possible. It was founded as the American Brangus Breeders in 1949 and has since evolved into the IBBA. The purpose of the IBBA is to enable members to serve the commercial cattle industry. For more information, visit GoBrangus.com. Watch the Brangus episode now online! For more information about Brangus cattle, visit GoBrangus.com or contact the International Brangus Breeders Association (IBBA) by email or call 210-696-8231. SAN ANTONIO, TX- The International Brangus Breeders Association (IBBA) has selected GeneSeek, a division of Neogen Corporation, as the association’s new genomics profiling provider. The partnership will allow Brangus breeders to submit DNA samples to GeneSeek for parentage determination and lay a foundation for Genomic-Enhanced EPDs for the breed association. “IBBA’s agreement with GeneSeek moves us closer to conducting all Brangus parentage testing using Single Nucleotide Polymorphism (SNP) genetic markers versus previously used technologies,” said Dr. Tommy Perkins, IBBA Executive Vice President. Samples will be tested with the GeneSeek®Genomic Profiler™ GGP HD 80K and the GeneSeek®Genomic Profiler™ GGP LD 30K for eventual incorporation into genomic-enhanced EPDs for the Brangus breed. The GGP 80K is finding a role as a premium genomic profiler, while the GGP LD 30K is a highly accurate, affordable option for routine testing of herd bulls and other seedstock. The arrangement allows Brangus breeders to request parentage as either a stand-alone SNP test or as part of their GGP HD 80K or GGP LD 30K results. Both profilers provide parentage verification along with a wealth of information on animal potential. Testing turn-around time is dependent on the type of testing requested. Brangus breeders should be pleased with the innovative direction they are going, said Ryan Ruppert, National Sales Director for Neogen GeneSeek. Genomics will have a growing impact on seedstock and commercial cow-calf operations, due to bottom-line benefits that matter to producers, he said. Some “lowly heritable” traits have a big impact on a rancher’s bottom line. An example is reproductive performance. This is partly inherited and is also affected by management and nutrition. Knowing more about maternal traits of seedstock bulls helps ranchers buy the right young bulls and then select and invest in heifers that will breed and calve efficiently. Using genomic profiles, seedstock producers can measure maternal traits in young bulls and market them on that basis. “Genomics helps you get the advantage of reliable EPDs without having to do years of progeny testing,” Ruppert said. While maternal traits help ranchers raise great mother cows, in other cases the seedstock operators’ customers are looking for terminal bulls that will pass along growth efficiency. Genomic profiles also predict performance factors for feed efficiency and feed conversion, as well as carcass quality and composition. The information puts added power in the hands of seedstock breeders and their customers. 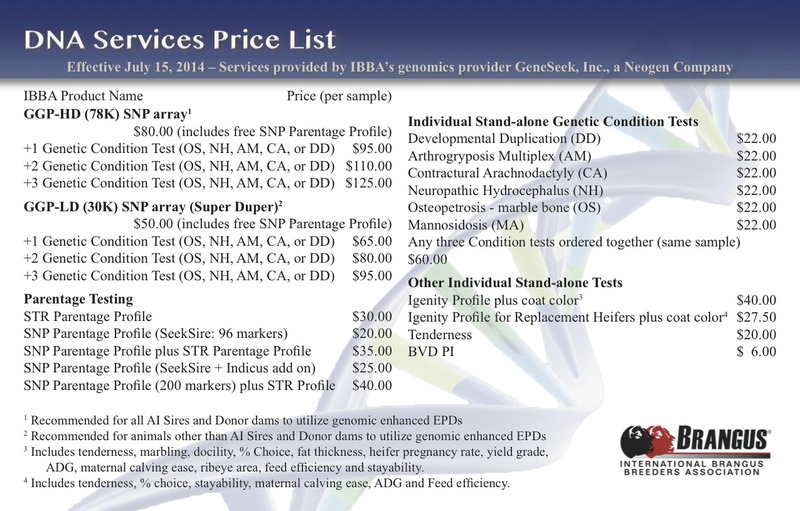 When IBBA members order tests from GeneSeek, results will be emailed or mailed. Contact Rosanne Sralla, IBBA Registry Specialist, by email or at 210-696-8231 with questions. For more information, visit www.GoBrangus.com. 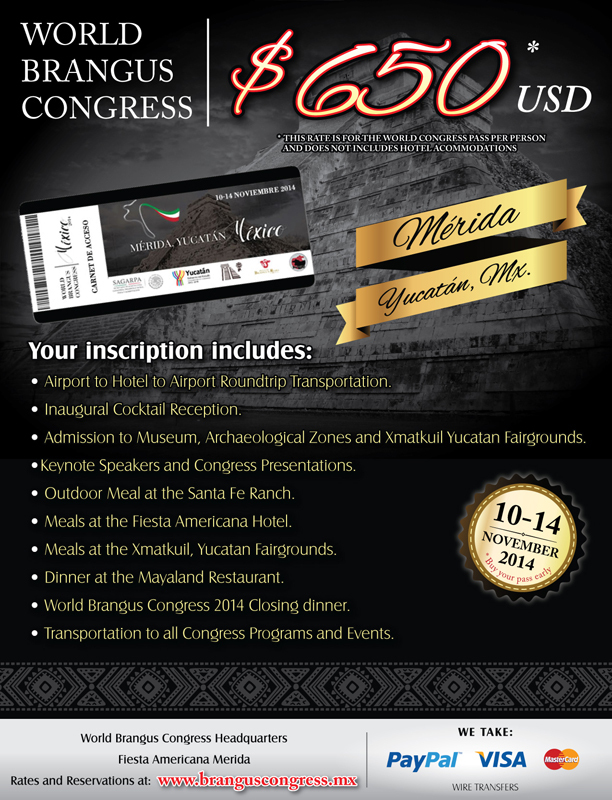 Make your reservations today, and join us November 10-14, at the 2014 World Brangus Congress in Mérida, Yucatán, Mexico! Visit www.branguscongress.mx/en for more information. 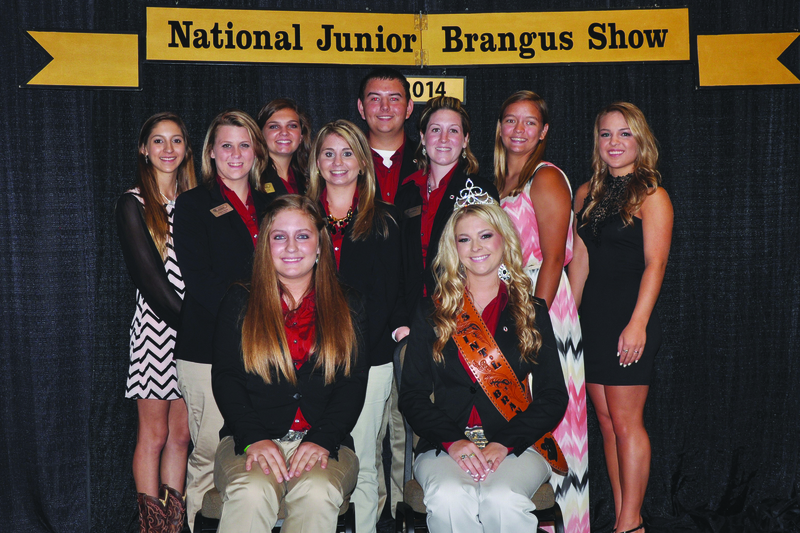 The International Junior Brangus Board of Directors for 2014-2015 was announced at the conclusion of the National Junior Brangus Show Banquet on Friday, July 25, 2014. The IJBBA Board of Directors is responsible for overseeing and managing the entire IJBBA as well as coordinating and hosting the annual National Junior Brangus Show. For more information about the Brangus juniors, visit junior.gobrangus.com. At the helm of the IJBBA this year will be Racheal Sharp. Sharp returns to the IJBBA Board for her third year of service and continues Oklahoma’s longtime representation on the IJBBA Board of Directors and in IJBBA leadership positions. Sharp brings a unique personality to the IJBBA Board and provides true leadership by example. A proven asset to the IJBBA Board, Sharp played a key role in the success of the 2014 NJBS by providing constant support to her fellow board members. She is destined to achieve great things and really provides the compassion, honesty and integrity to propel the IJBBA forward. Entering her senior year at Konawa High School, Sharp has been active in the Oklahoma Junior Brangus Association for several years, serving as royalty and holding several offices. Sharp’s value will continue to increase as the NJBS heads to Duncan, Okla., in 2015. In just two years of service on the IJBBA Board, Wallace has proven herself to be a valuable asset to the IJBBA Board of Directors. She has been a driving force in IJBBA’s recent financial success and is excited to continue to build on the momentum she helped establish. Wallace is eager to share what she has learned about IJBBA fundraising with all the new members of the Board, and the IJBBA Advisory Committee is excited about the level of enthusiasm Wallace brings to the association. As IBBA Queen, Wallace will serve as an integral part of the IJBBA Board of Directors and provide a unique link between the show community of the IBBA and the members of the IJBBA. Excitement for the upcoming year surrounds the newly elected Queen as she prepares for a year of travels around the nation serving as the ambassador of our great breed. Wallace will begin her sophomore year at Tarleton State University this fall and plans to double major in Animal Science and Pre-Medicine. Returning to the Board for her second year of service is Quinn Carter. A freshman majoring in Animal Science at Florida, Carter is rather new to the Brangus breed but brings a huge amount of motivation and drive with her to the Board. In her first year on the Board, Carter excelled in NJBS fundraising, accounting for $6,500 in sponsorships. She is excited about the opportunity the IJBBA Board provides junior members to meet breeders across the nation as well as the opportunities to travel and learn more about our industry as a whole. Carter plans to work toward obtaining a Veterinary Medicine degree and specialize in large animal treatment. The second of three Oklahoma juniors serving on the IJBBA Board of Directors is Colby Davis. Davis brings a super strong work ethic and entrepreneurial drive to the IJBBA Board of Directors. Davis has deep family roots in the agriculture industry and has been raising commercial Brangus cattle since the early ‘80s. Davis was the first in the family to venture into the registered side and is excited about the future of the Brangus breed. He will be a senior at Tahlequah High School this year and intends to continue his education at Oklahoma State University majoring in Horticulture while continuing his involvement in the Brangus breed. Meghan Pickett provides a spark of enthusiasm to any group she participates in, and the IJBBA Board is no exception. Her high energy and excitement about the breed shows through everything she and her family do. Pickett brings one of the longest tenures with Brangus cattle to the Board of almost any member as she started showing Brangus at age eight. The leader of a strong, dynamic family of Brangus enthusiasts, Pickett has a solid knowledge and understanding of younger IJBBA members’ interests and desires. Pickett graduated from Many High School this May and plans to attend McNeese State University majoring in Animal Science and Beef Nutrition. The youngest member of this year’s Board will be McKenzie Posey. With a solid foundation of Brangus showmen in her family, Posey brings a wealth of knowledge and tenure with the Brangus breed. In her first year on the Board, she brought a lot of new and exciting ideas to the table. Posey will also add to the entrepreneurial drive possessed by several other members as she has several years of egg production and marketing already on her résumé. She is excited to grow and develop new leadership skills while helping advance the IJBBA. Heading into her junior year at Wayne High School, Posey plans to attend Oklahoma State University and obtain an Agri-Business degree. Following in her older brother’s footsteps, Kendra Brull joins the elite group of IJBBA Directors. Brull will be a senior at Maur Hill – Mount Academy this fall. Brull has been a staple of the NJBS barns since she was old enough to get around and has been actively involved in IJBBA for more than 10 years. Active in varsity basketball and softball, Brull also has experience showing numerous other species. She currently serves as the president of her 4-H Council and the Atchison Shamrock 4-H Club vice president. Brull will bring a vast amount of level thinking, motivation and dedication to the IJBBA Board this year. Entering her freshman year at Butler Community College, Gardner brings eight years of experience with the Brangus breed to her second year on the IJBBA Board. Last year, Gardner served in the dual capacity of IBBA Queen and IJBBA Director and excelled at both. A very passionate individual, Gardner is a strong, quiet leader who has a wealth of ideas for improvement. Additionally, she brings a solid sense of good functional cattle from her experiences and success with livestock judging which she intends to continue in college. With a long list of leadership positions under her belt, she looks forward to an increased role on the national level with the junior association. Relatively new to Brangus breed and showing cattle, Emilee Garza did not hesitate to go after a position on the IJBBA Board. Motivated by the mentorship of past IJBBA Advisors, Garza feels the IJBBA Board will allow her to grow and learn more about the breed she feels is the “ideal standard for future genetics”. While new to the breed, Garza is expected to bring a fresh perspective to the way IJBBA functions. Already ahead of the game as a Level 1 Veterinary Technician, she plans to attend Texas A&M University majoring in Veterinary Medicine with the intention of becoming a large animal veterinarian. Returning to the IJBBA Board of Directors for the next two years is Allyson Polston. In just her first year on the Board, Polston was elected Secretary. Polston also helped double Florida’s NJBS representation by encouraging more Floridians to attend. With a solid résumé of achievements and leadership with Brangus cattle and in other agricultural and community organizations, Polston is eager to help build a bridge between NJBS and regional associations to hopefully increase participation at both levels. Polston will be entering her freshman year of college this year at Hillsborough Community College and has future plans to attend the University of Florida and major in Veterinary Medicine.